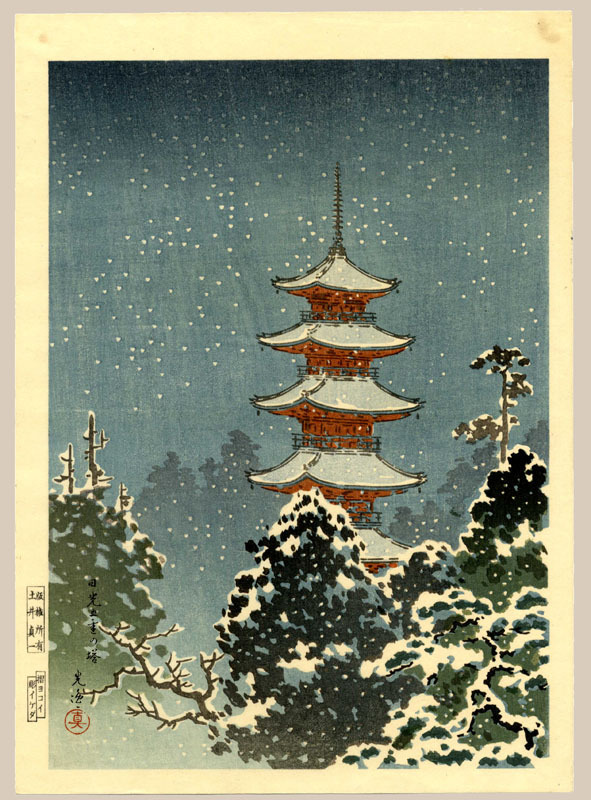 Koitsu, Tsuchiya (1870 - 1949), "Five-Story Pagoda, Nikko"
Fine, with faint residue on reverse top margin. Notes: Removed from original presentation folder; never framed or displayed. Provenance: From a private collection. For the past 30 years the prints were properly stored away; never being framed or displayed. The majority of the collection showcases rarely seen MINT colors; several far exceeding numerous examples seen in prior collections. Born near Hamamatsu, Tsuchiya Koitsu went to Tokyo at age 15 to study under Matsuzaki, a carver for Kobayashi Kiyochika. Kiyochika took him into his home where he remained for 19 years. He met Watanabe Shozaburo at an exhibition of Kiyochika's prints and this led to their collaboration. From 1932, Koitsu designed landscape prints for publication by Watanabe. His prints, which are often characterized by dramatic use of light, were also published by Kawaguchi and Doi.